I had the excellent opportunity to join in the third BarCamp in Zurich. BlogCamp Switzerland 3.0 was held on August 29th, 2008 at the Technopark in Zurich. ?This was my second attendance at BlogCamp Switzerland, I did a talk at the first one on March 24th, 2007 where I gave a talk called ?Photography and Writing for Blogs. BlogCamp Switzerland 3.0 included a cool mix of people and ideas. I listened to Cédric Hüsler (http://keepthebyte.ch/blog.html) talk about the impact of polling feed networks and how much traffic is wasted on checking if blogs have been updated. In the afternoon I went to hear Patrick Liechti from Sun Microsystems talk about organizing a Startup BarCamp type conference to educate people on how to form and succeed with new startups. This underscores the advantage of attending a BarCamp, lots of new ideas and exposure to new areas. I’m looking forward to attending BarCamp Berlin 3, which will be the third for that awesome city. This time I put together a talk centered on using Flickr as a way to integrate photography into a blogging workflow. This sounds a bit technical and boring, but I tried to get all blogging philosophical and hit on the idea that photos can be used to instantly communicate feelings in invoke emotional responses in ways which aren’t possible by blogging just using text. 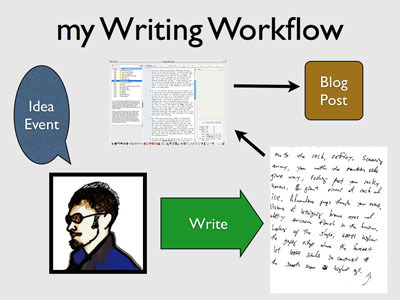 The fusion of text blogs with Flickr postings means you can market your blog content to a large number of people who are interested in visual stimulation. If your images communicate an essential message, they can be used as ways to bring traffic to your site. Furthermore, using the community aspects of Flickr enables very good interaction with blog readers. 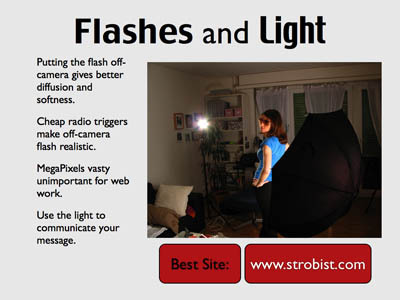 David Hobby knows this, the author of Strobist has skillfully used Flickr to build a reader base that wouldn’t have been possible if he had only blogged using his Blogger account. And after learning some things from David, I used Flickr to market my blog posts about photographer Joey Lawrence and his Photoshop DVD Tutorial with the Strobist Flickr group discussion board. I also hit on how Flickr is currently one of the best solutions to the problem of finding photos on an internet when search engines are still all text based. On Saturday, March 24th, I affirmed by place in the "Global Blogsphere" by giving a presentation at BarCamp Zurich. Essentially it was a gathering place for bloggers, and the coolest concept for a conference I’ve ever experienced and would love to explore this format for Smart Materials and other research endeavors. I won’t try to relate all the topics covered, as there were real journalist type bloggers who have done a much better job than I would. The concept is simple, meet people with similar interests (200 participants) and learn about what other people are doing. No paper to write, no registration deadlines for presentations, you sign up on the internet, you go there in the morning, pick your time-slot, you network, do your talk, network – awesome conference experience. I don’t actually remember how I found out about it, but when I found the BarCamp webpage and checked out the agenda, I signed up to give a talk on Photography and Writing for Blogs. I also won’t try to communicate all of what went on at BlogCamp Switzerland 2007, because bloggers with better talents for reporting facts like PeetTheEngineer and Markus Tressl have already done so. Why did I give a talk at BlogCamp Switzerland 2007? Because I normally give talks on Active Fiber Composites with graphs and microscopy images and focus on the finer points of delamination in Smart Materials or crack propagation due to stress concentrations at the interface between Interdigitated Electrode fingers and PZT fibers. Not that this is bad, but it seemed like a nice change of pace to talk about off-camera flash techniques and creating a "Mental Anchor" when creating blog content. My presentation centered on the idea of creating a Visual Anchor when creating blog content, in particular with writing and photography. Part of this included off-camera flash techniques, and how the advent of cheap radio triggers and flashes makes it easier than ever to create good photos and communicate ideas. In in the process I promoted www.strobist.com, as the best source on the web for learning how to use your flash. The writing section focused on using descriptive language to communicate a visual image for the reader in addition to transferring information. Naturally I used examples from the blog. "The Laughing Lemon cooking school is located in Zurich." "It sounds like the coolest cocktail you’ve ever heard of, but the Laughing Lemon is actually a cooking school in Zurich." 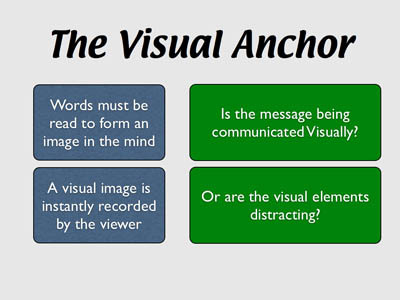 They both communicate information, but the second passage gives a visual anchor (an image in your mind) – and it sounds cooler. 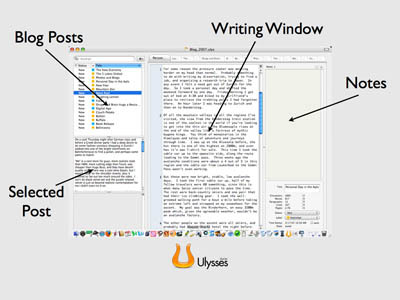 I got into workflow a bit and the use of writing programs like Ulysses to organize yourself and write more effectively. 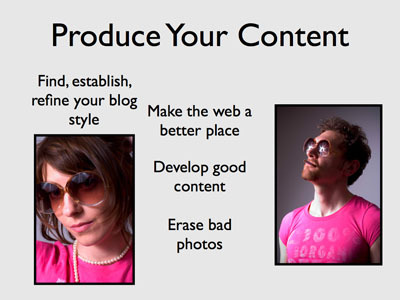 "Focus on developing good content to make the web a better place." "Delete the embarrassing photos your girlfriend takes of you." The discussion brought up some cool points, one (from Stefan Bucher I believe) being the idea that German bloggers tend to comment on and discuss events in their blogs, while American bloggers generally maintain a larger focus towards creating content. Essentially it’s the difference between writing a blog about your life versus writing about and creating a dialogue about world events on your blog. I’m hoping the folks who were at my presentation took away some warm feelings and fun ideas. From reading the bloggers who covered the event, it seems like the talk went better than the technical ones I give. It’s also possible that some thought I was some crack-pot American fool with a pointless blog who spends too much money on cameras – but I’m ok with that, life gets boring if you don’t take risks. Light painting and Scribbles – BarCamp Switzerland March 24, 2007, Zurich, Switzerland, International conference on blogging.